Unlike other South Beach Villas, this Pottery Barn inspired villa truly has it all! This 4 Bedroom, 3 Bathroom beachfront townhouse includes a Carolina room, living area, and master bedroom that all have broad views of the ocean and Calibogue Sound. The kitchen has granite counter tops, all new lighting, and stainless steel appliances. The queen bedroom on this level has an adjoining bathroom. On the second floor is a master bedroom with a king bed and an en-suite bathroom. There are two other bedrooms upstairs one with a queen bed and one with two twins that share a hall bathroom. All of the bathrooms were also updated to include granite vanities and new fixtures. This townhome is just a short walk to South Beach Marina pool, South Beach Racquet Club and the Marina shops, restaurants, and watersports. 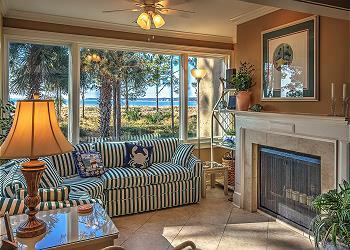 This is one of the best beachfront values among Hilton Head Sea Pines rentals!